The policies stated below are only applicable if specifically referenced -- if not referenced, all site content is licensed under CC BY-NC 4.0, as explained on the use policy page. Content in The Virtual FossilMuseum.net may not be copied, resold, used or modified in any manner for commercial purposes such as web sites, popular press and educational books or for any other commercial use, without the written consent of the webmaster: . In this case, credit should be given as above in print, and a link included for content placed on the Internet or within electronic or social media. 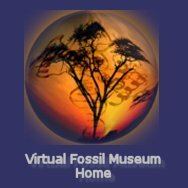 The Virtual Fossil Museum’s purpose and mission is fostering scientific education, and we operate on a non-profit basis, having benefactors who supply all VFM needs. The board considered changing the site to a more open license, but ultimately rejected the move due to extensive and repeated copyright violations by creationist and intelligent design websites and publications (see example at Pharyngula). Because of this, for now, we will retain restrictive copyrights, and will in no circumstance give permission for use of Virtual Fossil Museum content to individuals, organizations, or publishers, for use in non-scientific purposes such as creationism or intelligent design, which are antithetical to our own purposes and beliefs. Credit is given to the Virtual Fossil Museum. For websites, cite image courtesy of the Virtual Fossil Museum, www.fossilmuseum.net, with link to the museum For publications cite: image courtesy of the Virtual Fossil Museum, www.fossilmuseum.net. For websites, provide a link our home page. Usage is not so extensive as to replicate a portion of the museum. It is rather subjective as to what “extensive means”, so e-mail the webmaster that will make a determination, based on the value to the educational community. In the future, the VFM may charge a small fee for image use of for-profit publishers. This will not become the case until the VFM has designed a means for said fees to be donated to the educational community. For now, we have ceased to obtain and retain and provide high resolution images above 72 dpi because it was simply too time-consuming, and the files are too large for e-mail. We do, however, file large images (normally 1600x1200) that do not have the Virtual Fossil Museum name on them, as would be desired by most publishers. We apologize for being slow at answering e-mails; there is simply not enough time, and there is too much spam. Hopefully, the above guidelines will allow your proceeding when we are slow or remiss. Finally, remember the immortal words of Crosby Stills and Nash, to Teach Your Children Well.